Welcome to the forums <img src="/images/graemlins/laugh.gif" alt="" />. 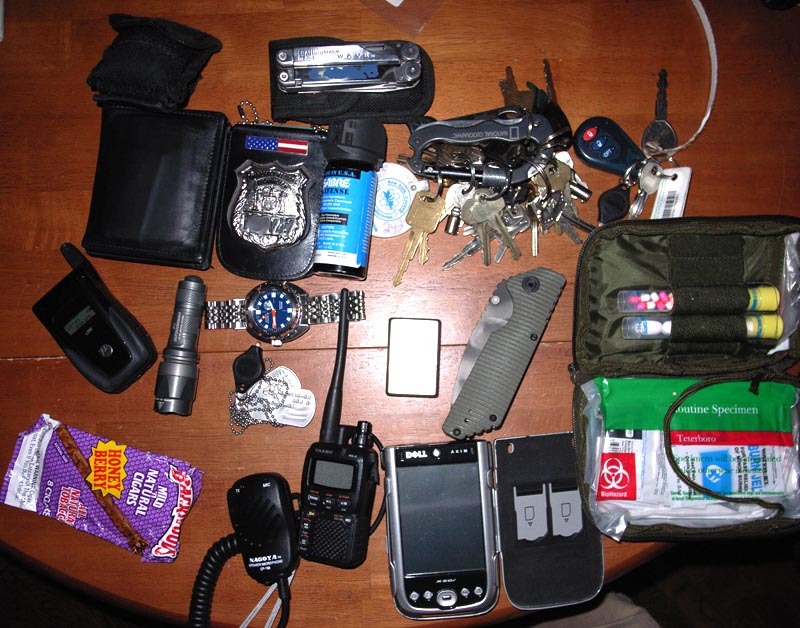 You seem well set with your EDC. Changed mine a bit. Downgraded FAK. Upgraded blade to Strider. Watch is Doxa. Added Pepper Spray. Light is SF E1L. Matt, I see you are a fan of the Backwoods Honey Berry. My second favorite cigar. Hello everyone, I am still designing the best/most practical way to take the all the stuff for my needs with me every day. Van keys with ARC AAA-P , blue glowring and Peter Atwood "Prybaby"
There is also a basic first aid kit in the large rear pocket...just in case. Simbad, that sounds like a pretty comprehensive kit. Im working on something VERY similar to carry in my new Maxpedition Devildog. Whereabouts are you in Mallorca? Its just about my favourite part of the world, I holiday at The Playa in Camp de Mar whenever I can. My dream is to one day live in Mallorca, Ive visited a good few of the knife stores in Palma, Paguerra etc but NOT seen any good outdoor/survival shops, could you please tell me if there are any? Hopefully, I'll be back out there in August. Good luck with the kit. Theyre always a work in progress. Stu, I take all that stuff in a typical Eastpak bag, this paricularly model has many pockets and compartments, it's made in Cordura fabric. 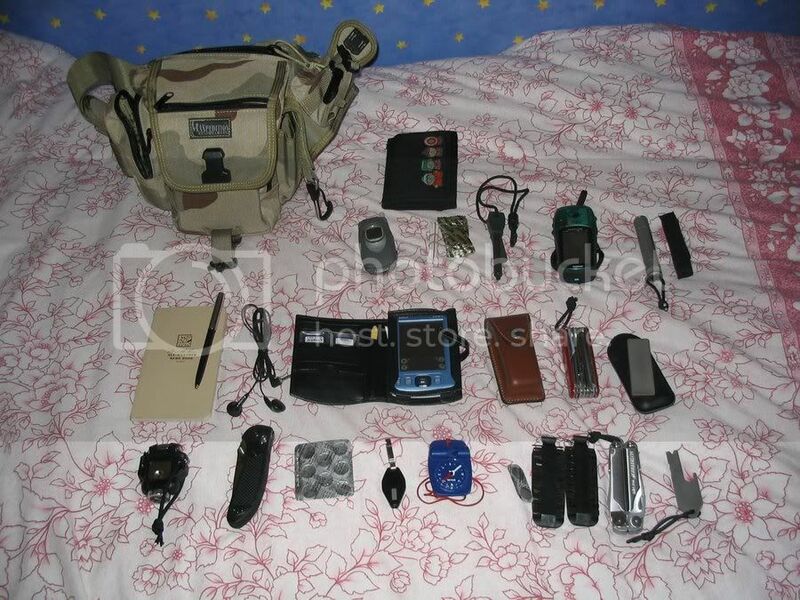 I also have a Maxpedition Proteus but is too small to take extra things like food, books or a jersey. As for a change I would try the Maxpedition Monsoon, I like the way to carry a single sling bag. I live in a small village (4,700 population) called Alar? at the step of the mountains of Tramuntana near the center of the island at 25Km away from Palma. Camp de Mar is a very nice place, that is the "rocky" side of Mallorca, I used to go there in summer for swimming and "jumping" from the cliffs, very deep water though. If you're coming in August just drop me an e-mail or a PM here to make a "Mallorca get together". Hi, Simbad. I'll look you up if I get out there in August, Im starting a new job soon & unsure what theyre like for holidays. I had afew too many holidays last year, spent about 7 weeks out of the country (5 of them in Camp de Mar). Sadly, I think THIS years gonna be about working hard.